Fresh fish crudo is the perfect light appetizer before any hearty holiday feast, but also easy enough to make for quick weeknight meals. Combine salt, 4 ounces sugar, orange zest, fennel and chili flakes. Press mixture into fish and cover entirely. Place fish in dish, and cover in plastic wrap. Chill for 1 hour. Wash off rub with water and pat dry. 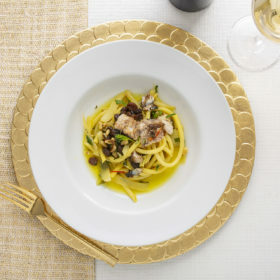 Place fish on a clean dish. Cover and refrigerate for 1 hour. Combine orange juice, vinegar, 1 tablespoon of sugar, celery, basil and chili oil. Remove fish from refrigerator. Brush platter or plate with olive oil. Place fish on platter, and slice as thinly as possible. (Cut straight down, not on angle.) Drizzle with olive oil. Top with marinade. Serves 6. Illuminati 2017 Costalupo (Trebbiano d’Abruzzo). Ultraripe aromas of tropical fruit, Satsuma orange and perfume waft from the glass. This is plush and ripe in feel, boasting a wealth of yellow apple, pear and sweet orange flavors, with a mild vein of acidity offering balance.